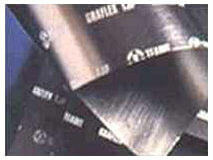 Flexible graphite is manufactured from mineral graphite (expandable flake graphite). It is also called graphite foil. As its name indicates, flexible graphite is flexible and conformable, an ideal property as a gasket material. Flexible graphite can also be used in many other thermal, electronic or electrochemical applications. Works in temperatures up to 950ºF in an oxidizing atmosphere. 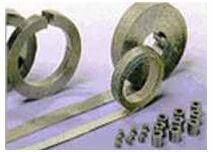 Heat and chemical resistant gasket, seal, liner; sheet lubricant; thermal conductive seal; heat barrier; EMI (electromagnetic interference) shielding and gasketing, heat dissipation, stress sensing, vibration damping, spark plasma sintering (SPS), and other thermal, electronic or electrochemical applications.